Use your fish to pop bubbles, collect powerups, and avoid mines to obtain a maximum highscore! Use your mouse to control the fish. Get the fish in the water before they dry up and die out. Use balloons, gravity and your wits to launch and release arsenal of weaponized pushing balloons. Try not to pop your bubble by avoiding the oncoming bubbles and not falling or flying off the screen! You are the golden bubble, collect all the other bubbles but avoid the spikes! The sequel to Bubbles - Now with more than twice as many power-ups, new funky music and a physics based 2 Player modus! You're a bubble and your goal is to catch other bubbles to grow bigger and gain points. Pretty simple. Touch the bubbles. Don't let em get away. The sky is grey, looking over cast. Still, you fire your bubbles so fast. 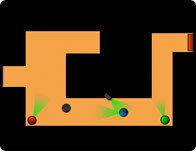 Use colors, numbers, blind luck or the force to target and eliminate all of the floating balls in this fun shooter. Free yourself from the bubble in which you are imprisoned. The bubble can be pierced by a nail which is situated in the window. Logical thinking and skills will help you. Guide soap bubble through challenging levels. Spend a whole day defending your territory against waves of sea creatures brought in by the tide! A simple game: get the blue bubbles... Enjoy!